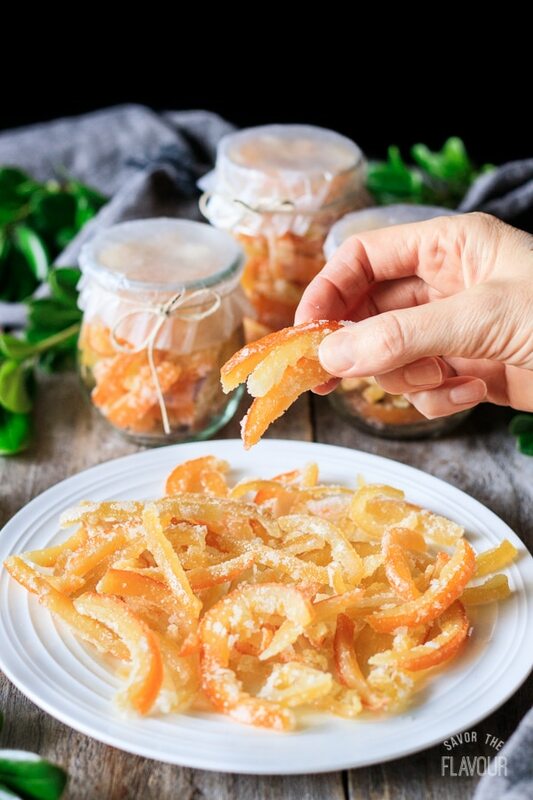 Lemon and orange mixed peel is a DIY recipe for homemade candied citrus peel. 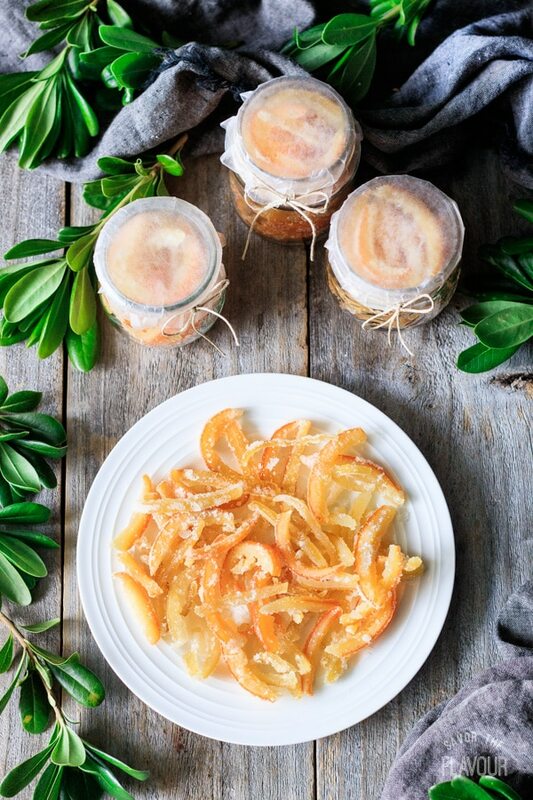 These addictive fruit treats are blanched, steeped, and cooked in a simple syrup, then dried out and dusted with sugar. 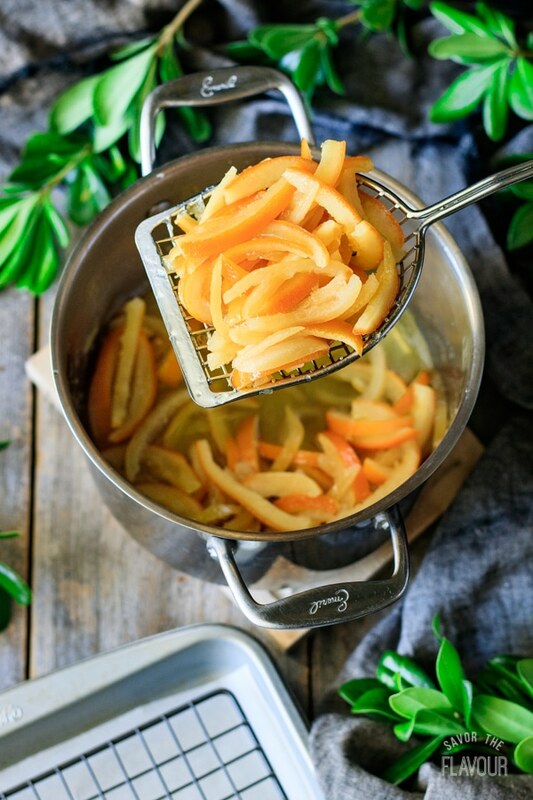 Use in cookies, cakes, sweet breads, and other desserts like French orangettes. 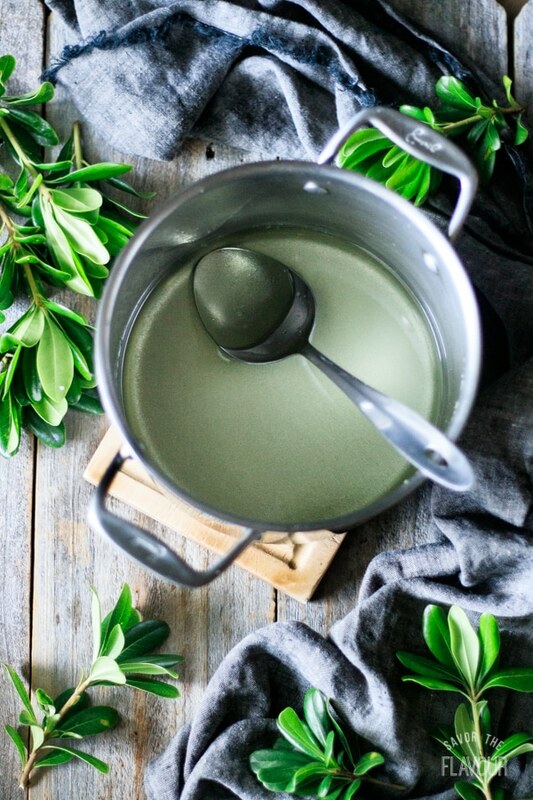 This Christmas, make some for holiday gifts and your kitchen will smell heavenly—just like Grandmother’s. Lemon and orange mixed peel is one of those recipes you will be glad you made. I’m a huge fan of anything fruit related–fresh, dried, candied. This mixed peel recipe is easy to do; it just requires patience, as the process covers two days. If you have purchased store bought peel in the past, and didn’t like the taste, give this recipe a try. The taste comparison is like day and night! I will guarantee that your children will be sneaking pieces for snacks, as it’s quite addictive. If you like British baking, you’ll find yourself making homemade mixed peel at least twice a year, for your Christmas and Easter baking. 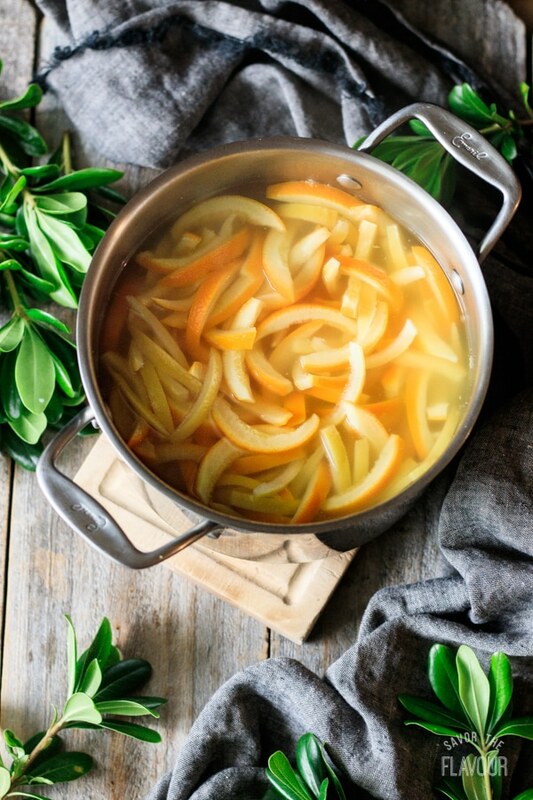 And as an added bonus, when you make this recipe, delightful citrus smells waft through the house–a total stress reducer. 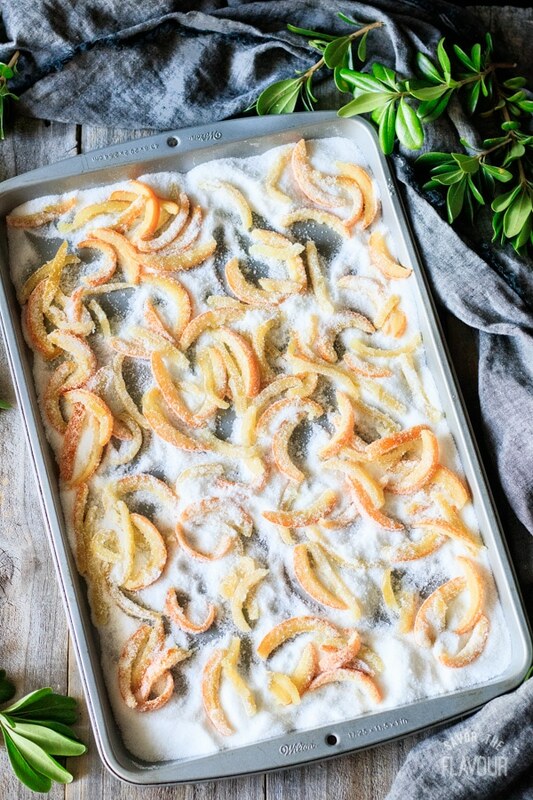 Mixed peel is the candied peel of citrus fruit. Historically, it was made to preserve the citrus fruit, so it would have a longer shelf life and eliminate waste. 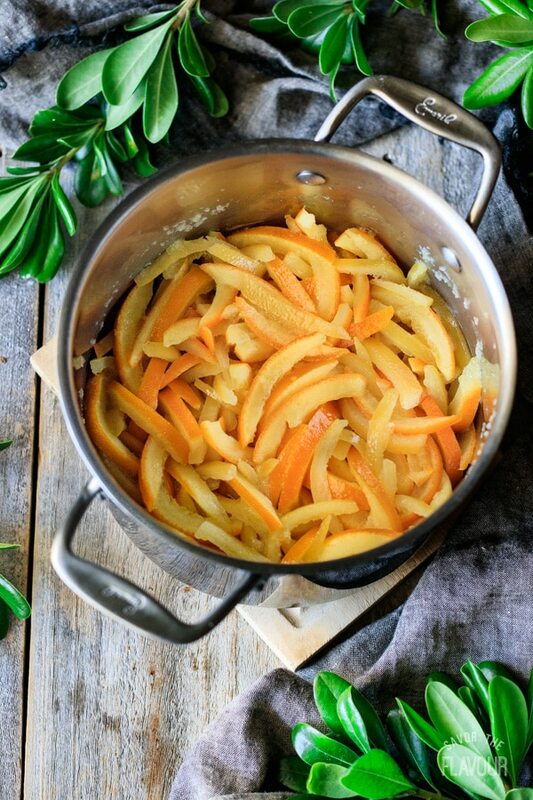 The citrus peel is blanched, steeped, and cooked in a sugar syrup until the sugar replaces the moisture in the peel. It is then dried out and tossed in sugar. 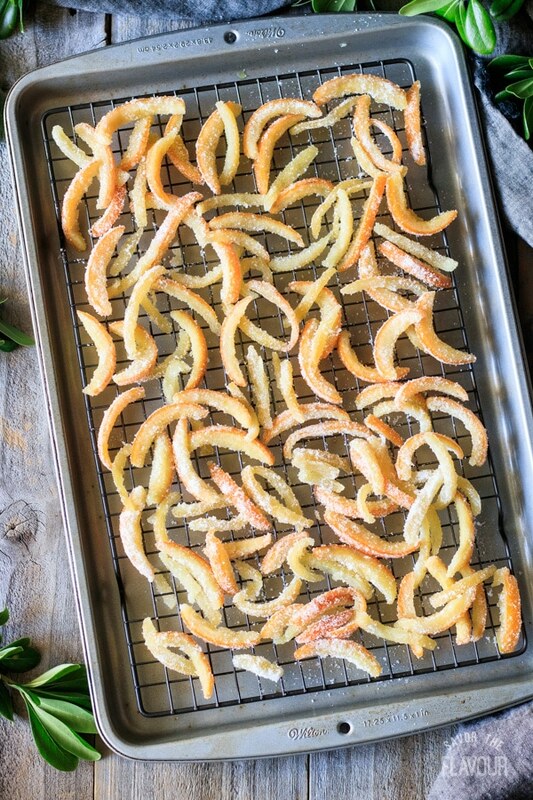 In Europe and Canada, the term mixed peel is commonly used in recipes, but in the U.S. the term candied citrus peel is more commonly used. What citrus fruits can I use to make mixed peel? Why make your own mixed peel? It tastes much better than store bought. It has no chemicals, corn syrup, or additives. It is fresher than store bought. It is a wonderful homemade gift for the holidays. It is a great way to use up extra homegrown citrus. How do you use mixed peel? Fruit Salad: like cranberry-citrus fruit salad. How can I remove the peel from the citrus? Score the fruit in 4 to 8 sections with a pairing knife, then peel by hand. Cut off both ends, then carefully cut the peel off from top to bottom. Peel oranges and tangerines by hand. Scrub and dry the citrus, and measure out the sugar. Remove the peel from the fruit. See above for three different methods. Cut each piece of peel into 1/4 to 1/8 inch strips. It’s okay to leave the pith on the peel. Put the peel into a pot and cover with cold water. 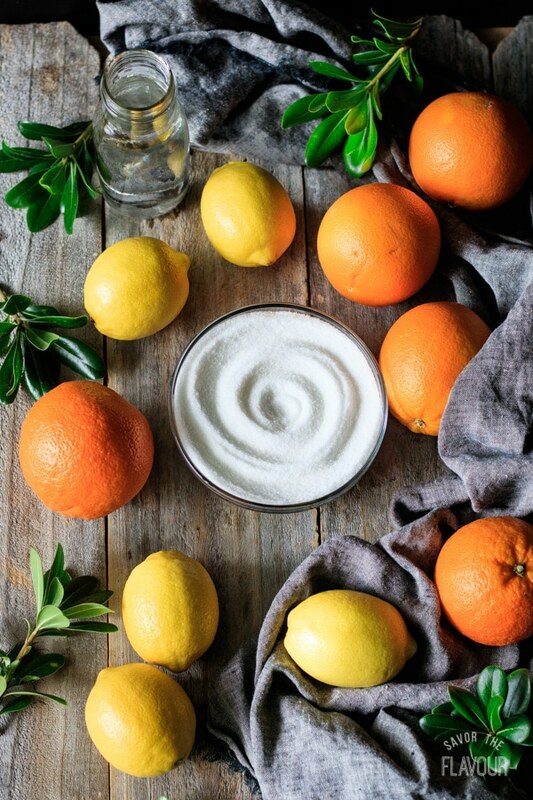 Make a sugar syrup by combining 1/2 cup of the citrus liquid and 1/2 cup of water with 1 cup of sugar. Stir over medium high heat until the sugar is dissolved, then bring it to a boil. Remove from heat. Add the peel to the simple syrup. Press it down with a large spoon, so the peel is submerged into the sugar syrup. Cover and let the peel steep in the sugar syrup for at least of 10 hours. Make another simple syrup (1 cup of water with 1 cup of sugar), and pour the syrup over the peel. Bring it to a boil, reduce heat and simmer for 1 hour to 1 hour 15 minutes. The peel should be jewel-like and translucent. Remove the peel from the pot with a large slotted spoon. Let the peel dry on two wire cooling racks that are sitting on parchment-lined baking trays. (If you don’t have parchment, use wax paper or brown paper. It’s just there to catch the sugary drips.) Keep the citrus simple syrup to use in drinks, poke cake, or citrus curd. You should have roughly 1/2 cup. Store the citrus syrup in a mason jar in the fridge. Once the peel has dried out for a while, but is still tacky, toss it in white granulated sugar. To test for doneness, drop a peel onto a plate. You should hear a clink when it hits the plate. If not, bake it longer, and when it is sufficiently dried, take it out of the oven to cool. Once the mixed peel is cooled, store it in an airtight container. You can choose to add extra sugar. Storage options are: a cool, dry place, in your fridge, or in the freezer. 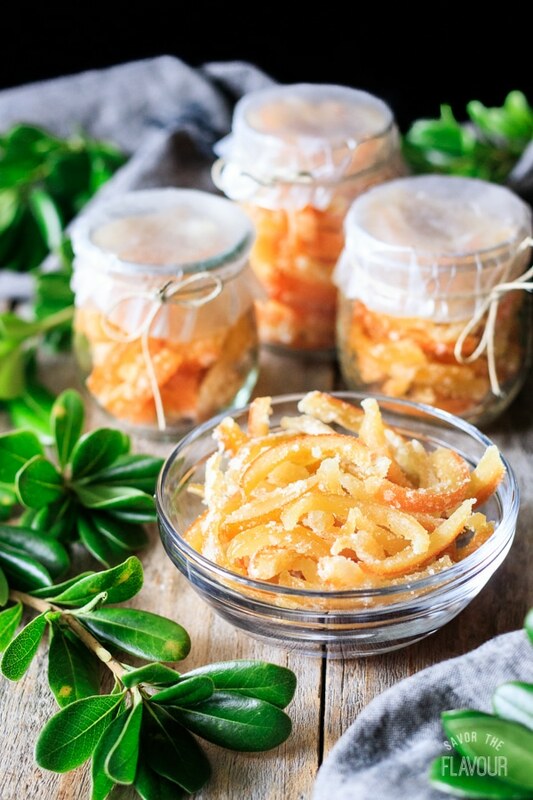 If you want to use some of your mixed peel for holiday gifts, find some pretty jars, and fill them up with peel. Tie on a bow, add a gift tag, and a card with ideas on how to use it in baking. Buy organic citrus, if possible. If not, scrub the citrus well to take off chemicals and wax. Score the rind before peeling it to make it easier to remove. Leave the pith on the peel; it yields a thicker piece of fruit. Blanching removes the bitterness from the peel and pith. 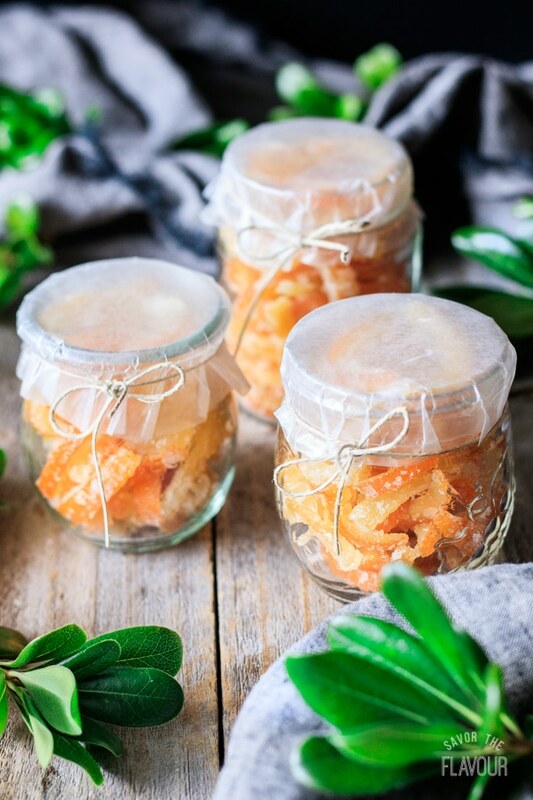 Blanch orange peels twice, lemon and lime peels three times, and grapefruit and citron five times. These other fruit peels are more bitter than orange peels, and need more blanching time. Keep the leftover orange and lemon simple syrup for drinks, a poke cake, or a citrus curd. 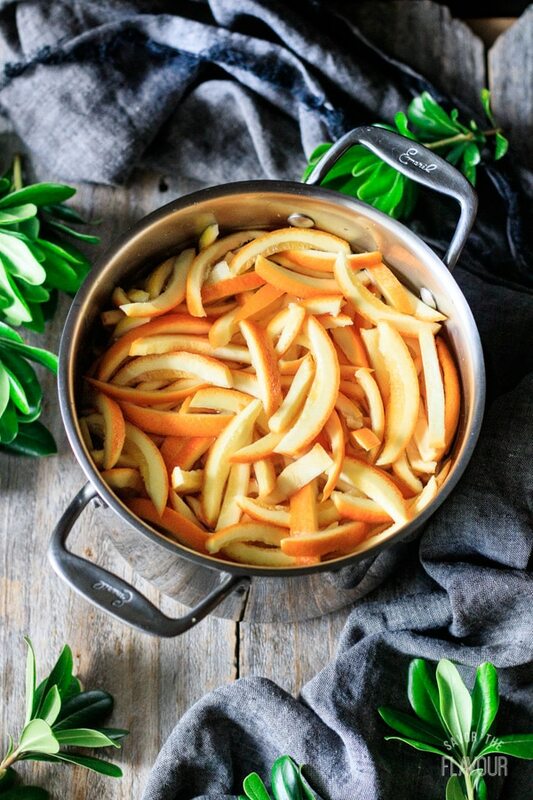 Make sour orange peels by adding citrus acid. High humidity or short on time? Bake for one to two hours, or until dry, at a low temperature (170 F). 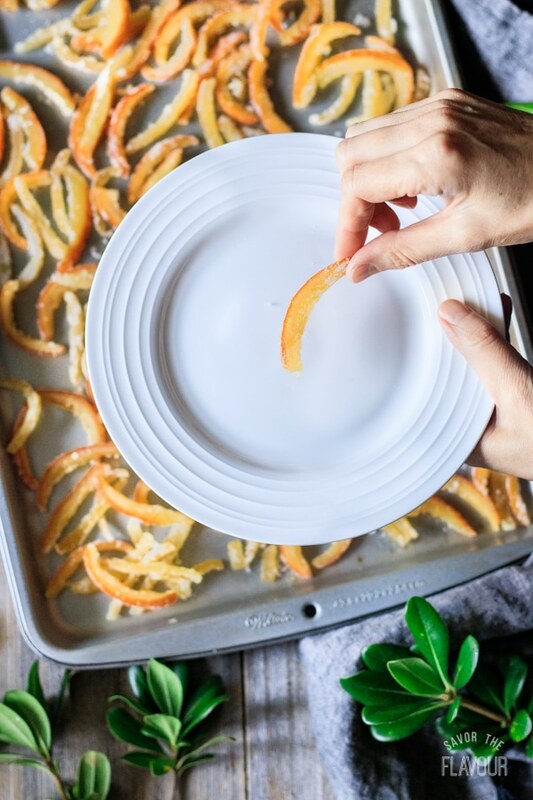 Test for doneness by dropping a citrus peel on a plate. It should make a clinking sound when it is dropped. Keep the peel in an airtight container with extra sugar and keep in a dry environment. Alternatively, store in the fridge or freezer. This recipe has been inspired by New Zealander Tricia Curtis’ recipe on her blog Naturally by Trisha. Make some new holiday baking memories this year and involve your children, nieces and nephews, and grandchildren when making this recipe. They can help with the less dangerous parts of the process: selecting the fruit, scrubbing and drying it, laying the cooked fruit slices on a tray, tossing it in sugar, prepping it for storage, or packaging it up for holiday gifts. Oh, and they can definitely be part of your taste testing crew – that’s the best part! Looking for some yummy recipes that use mixed peel? We’ve got you covered! Stollen: a German Classic: a fruit-filled Christmas bread that has a vein of marzipan running through the middle. Making a Traditional Christmas Cake: a moist family favorite dessert during the Christmas season. Did you make this lemon and orange mixed peel? Please leave a star rating below the recipe to share how you enjoyed it. 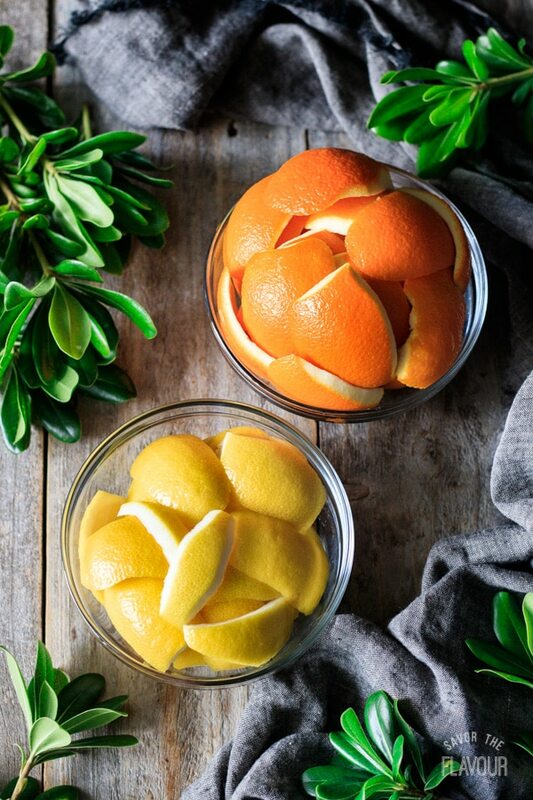 Scrub the lemon and orange rinds to remove wax and chemicals. Cut the lemon rind off the lemons with a sharp knife, if you want peel the oranges by hand. 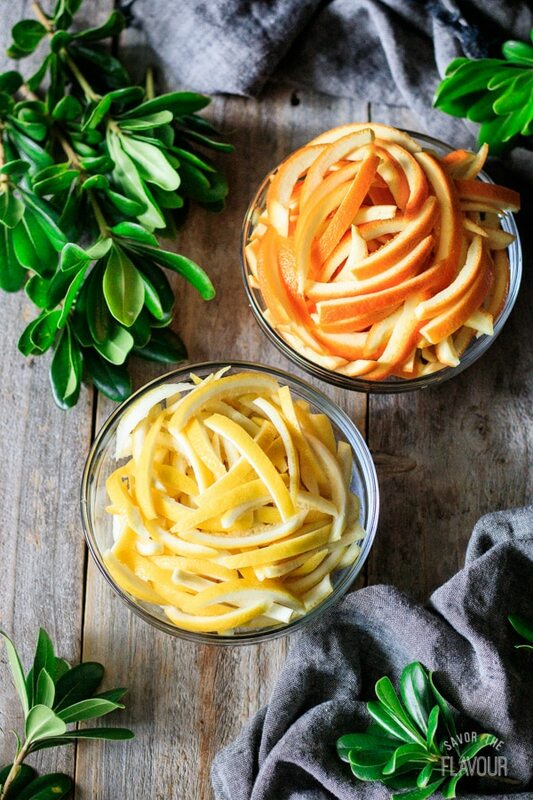 Cut the citrus peel into strips about 1/4 to 1/8 inch wide. Put the peel in a saucepan and cover with water. Boil, then simmer for 10 minutes. Drain off the water. This is the blanching part of making mixed peel. Repeat step #2 two more times. Put the peel in a bowl. The each time you blanch the peel it removes some of the bitterness. This is why you need to blanch grapefruit and citron more than oranges. Stir together 1 cup of filtered water, and 1 cup of sugar in the saucepan. Stir the mixture to dissolve the sugar, then bring it to a boil. Dump the peel into the boiling syrup, remove from the heat, and leave it to steep with the lid on for a minimum of 10 hours. Drain. Most of the sugar syrup will have been absorbed into the peel, but it will still have some liquid in the pot to drain off. Make another sugar syrup by adding 1 cup sugar to 1 cup filtered water. Gently stir the mixture over low heat until the sugar dissolves. Bring to a boil, reduce heat and put the steeped peel back into the pot. Simmer for 1 hour to 1 hour 15 minutes. You want the peel to be jewel-like and translucent. Drain the peel and spread out on two wire cooling racks to dry overnight. When the peel is still tacky, toss it in 2 cups of granulated sugar, then let it finish drying completely. The peel should be hard enough to make a sharp plink when it’s dropped on a plate. Quick Dry Method: Put the peel on parchment-lined cookie sheets and bake it in the oven, at the lowest setting (170 F) for 2 hours to dry out the mixed peel. Taste the peel. If you would like to add additional sugar, sprinkle some more on top. The peel steeps for about 10-12 hours and dries for about 24 hours. It’s best to make it 2 days before you need it. The mixed peel will keep well in the fridge for one month in an airtight container or longer if stored in freezer bags and placed in the freezer.